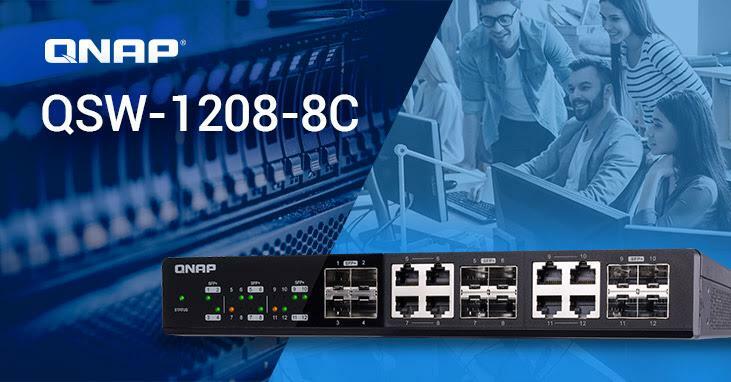 QNAP has released their new QSW-1208-8C and QSW-804-4C 10GbE/NBASE-T unmanaged switches to help home and small businesses users upgrade their networks. The NBASE-T-based switches delivers a cost-effective solution for improving network performance while using existing Cat 5e, 6 and 6a cables. The QSW-1208-8C has twelve ports, including four SFP+ and eight SFP+/RJ45 combo ports and the QSW-804-4C has eight ports, including four SFP+ and four SFP+/RJ45 combo ports to ensure an optimised investment in 10GbE networking. The QSW-1208-8C and QSW-804-4C are also backward compatible with legacy devices, and support the IEEE 802.3az standard for reducing power consumption while maintaining high network performance and quality. The QSW-1208-8C and QSW-804-4C can function as a desktop-based or rackmount-based solution. Both switches feature a sleek modern design to blend in with other devices in digital homes and offices. The smart fan mechanism enables efficient heat dissipation to ensure high performance while staying near-silent for minimising background noise. The QSW-1208-8C unmanaged switch is now available; the QSW-804-4C will be available in April, 2018. For more information and to view the full QNAP NAS and peripheral lineup, please visit www.qnap.com.